At the First Impressionist Exhibition, which opened on 15 April 1874, Eugène Boudin is listed as showing six items, although in fact these covered three oil paintings, six pastels, and four watercolours: thirteen works in all. He was born in Honfleur, on the north coast of France at the mouth of the River Seine opposite Le Havre, on 12 July 1824. His father worked on the Le Havre-Honfleur ferry, and in 1835 the family moved to Le Havre, where the following year Eugène started work at a printer’s then a stationery shop. In 1844 he opened his own stationers which also framed paintings, but the following year Millet saw some of his amateur paintings, and Boudin resolved to make painting his future. His shop framed the work of, and sold art materials to, Couture, Troyon, and Millet. It was also a centre of artistic activity which drew the young Claude Monet (who grew up in Le Havre too) to seek Boudin’s counsel and instruction. By 1847, Boudin had made his way to Paris, where he started to study paintings in museums and galleries. He returned to Le Havre, and in 1851 was awarded a scholarship by his local council to study painting in Paris. His application was supported by Thomas Couture and Constant Troyon. Until 1860, he lived in Paris, copying paintings in the Louvre, and returned to the north coast to paint there en plein air whenever he could. However he did not apparently engage in the anticipated studies at the École des Beaux-Arts, and remained largely self-taught. He had his first painting accepted for the Salon of 1859. In 1861 he worked with Troyon, and in 1862 made friends with Jongkind. Two years later, Monet, Jongkind and he met and painted together in Honfleur. He started to become commercially successful in 1864, his income peaking in 1872, but declining thereafter. His friendship with and support to Monet resulted in him being invited to take part in the First Impressionist Exhibition in 1874. In 1881, he became represented by Paul Durand-Ruel, and in 1883 the Durand-Ruel Gallery staged his first one-man exhibition in Paris. That year he was also awarded a second class medal in the Salon. In 1885, he visited the south of France during the winter, and from 1890 onwards spent the winter months there, so that he could continue to paint. In 1887 his works were shown in the USA, where he was represented by Durand-Ruel. Further exhibitions followed in France. However his health deteriorated rapidly in 1898, and he died on 8 August that year. 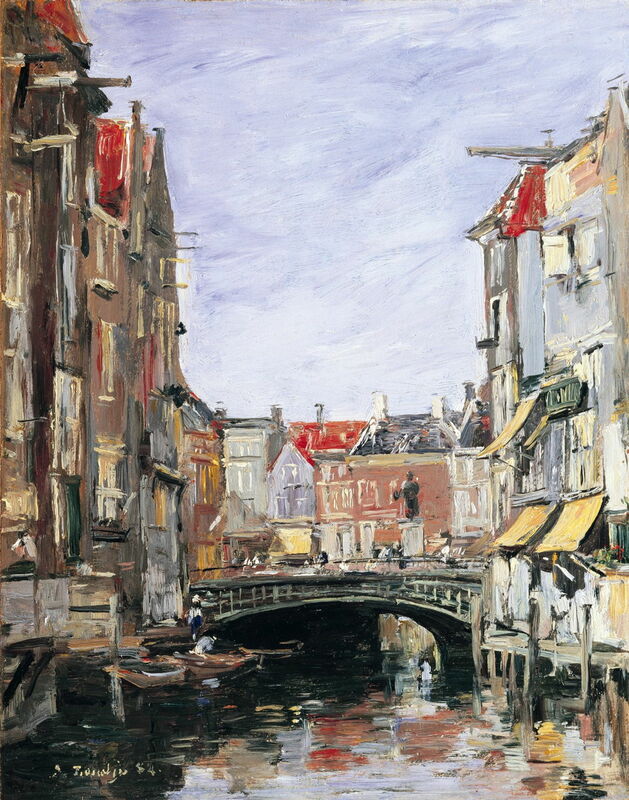 It is estimated that he produced over 4,000 oil paintings, and over 7,000 pastels, watercolours, and drawings. 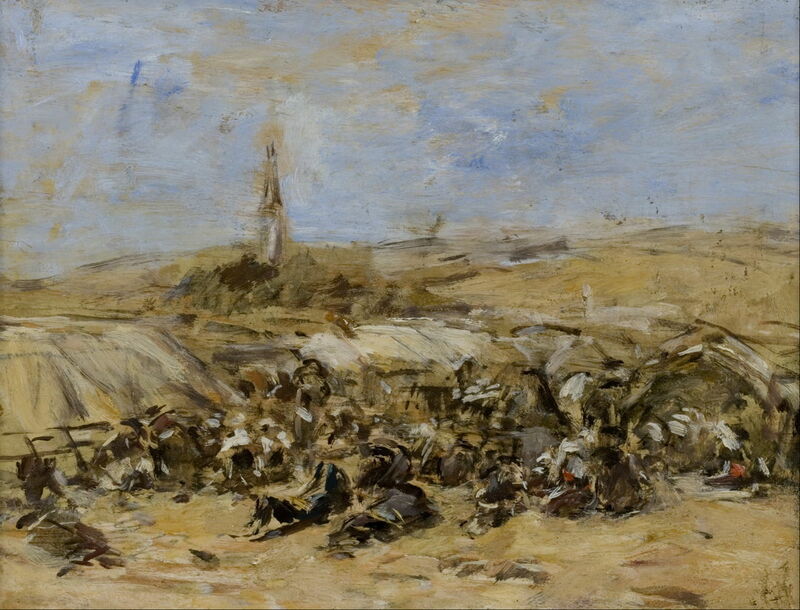 Eugène Boudin (1824–1898), Pardon of Sainte-Anne-La-Palud (study) (1858), oil on wood panel, 23.2 x 17.5 cm, Musée d’art moderne André Malraux, Le Havre, France. Wikimedia Commons. On the last weekend in August, 1857, Boudin visited the Finistère region’s largest religious celebration, and made sketches in oils, including this The Pardon of Sainte-Anne-La-Palud (study) (1858). These he used to paint a more traditionally finished oil painting, which was shown in the Paris Salon the following year, where it was praised by Baudelaire. More typical of his early finished paintings, The Beach (1864) shows an assorted gathering beneath one of Boudin’s wonderful skies. These became such a feature of his work that Corot described him as ‘the master of the skies’. 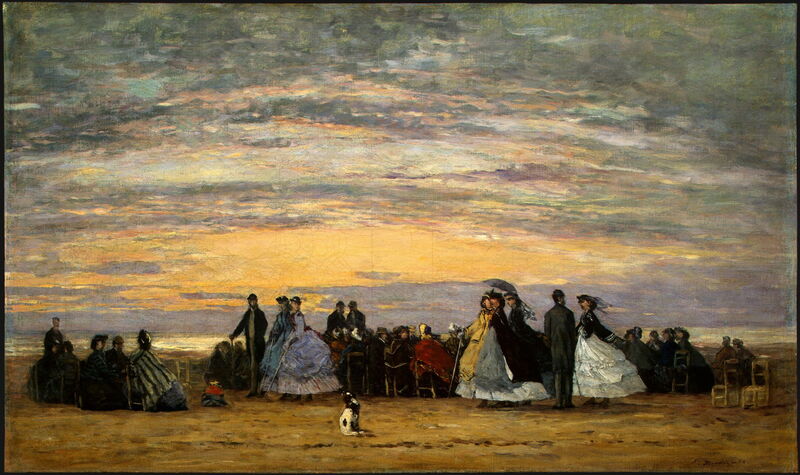 The Beach at Villerville (1864) shows a dusk setting which is unusual in Boudin’s beach paintings. It is set in another small seaside community between Trouville and Honfleur. 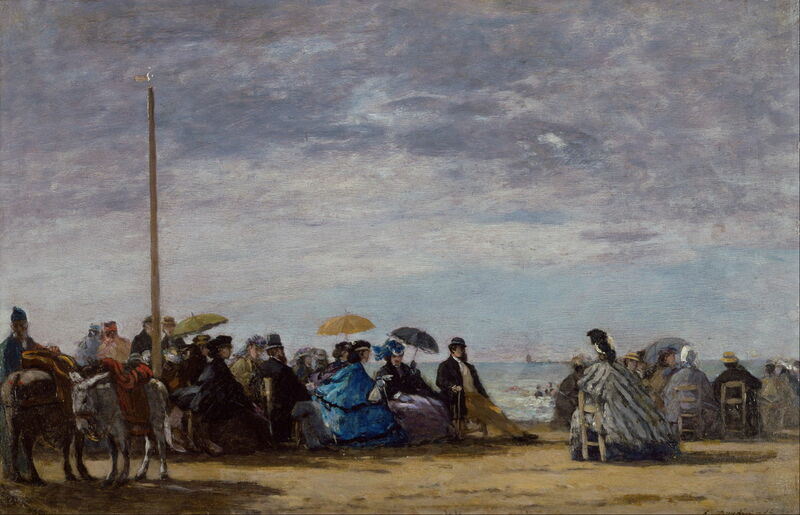 Eugène Boudin (1824–1898), Princess Pauline Metternich on the Beach (1865-7), oil on cardboard mounted on panel, 29.5 × 23.5 cm, Metropolitan Museum of Art, New York, NY. Wikimedia Commons. For a while, Boudin painted celebrities including Princess Pauline Metternich on the Beach (1865-7) when they visited the seaside around Honfleur and Le Havre, but as he became more successful in the Salon, he dropped these rather opportunistic sketches. Eugène Boudin (1824–1898), Village by a River (c 1867), oil on panel, 35.6 × 58.4 cm, Metropolitan Museum of Art, New York, NY. Wikimedia Commons. He also painted many ports, ships and boats, and riverside scenes, such as Village by a River (c 1867), whose precise location remains uncertain. 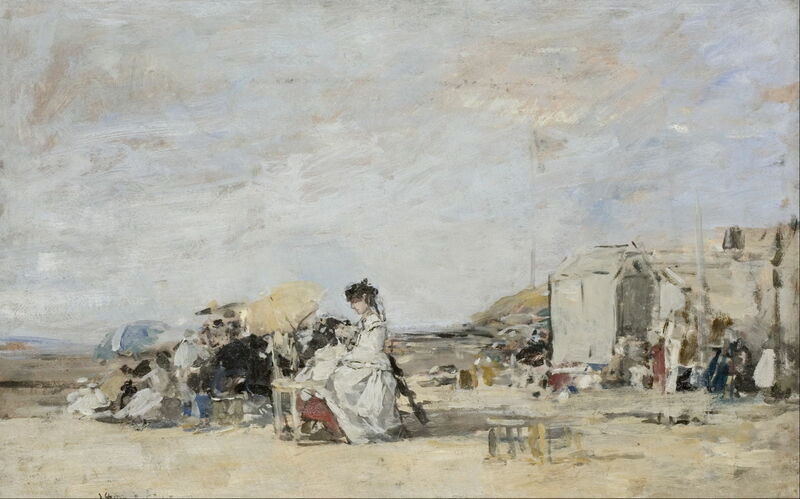 Eugène Boudin (1824–1898), Lady in White on the Beach at Trouville (1869), oil on board, 55.3 x 38 cm, Musée d’art moderne André Malraux, Le Havre, France. Wikimedia Commons. 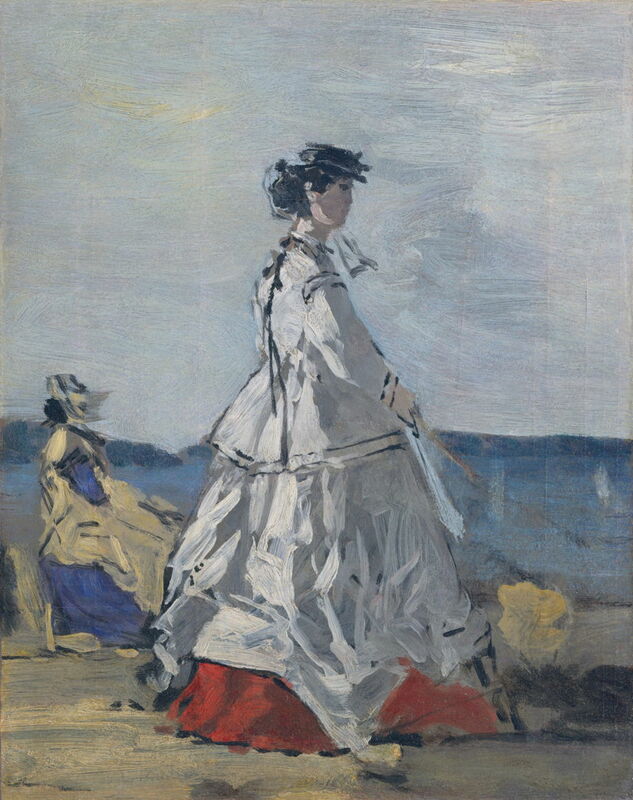 His oil sketches, here of a Lady in White on the Beach at Trouville (1869), were amazingly loose and painterly, and clear inspiration to Claude Monet and the Impressionists more generally. As far as I can see, it is hard to identify which of his suriving paintings were included in the First Impressionist Exhibition. One, showing the promontory of Le Toulinguet at Camaret, is likely to have been one of three paintings. 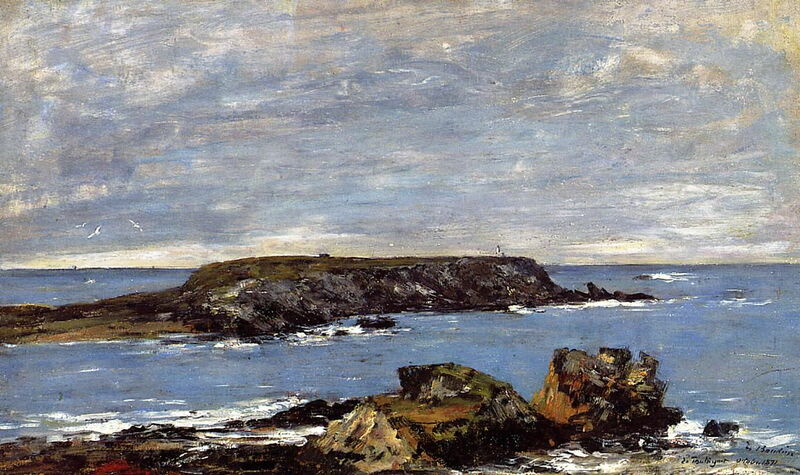 Eugène Boudin (1824–1898), Camaret, Le Toulinguet (c 1871), oil, 40 x 65.4 cm, Private collection. WikiArt. 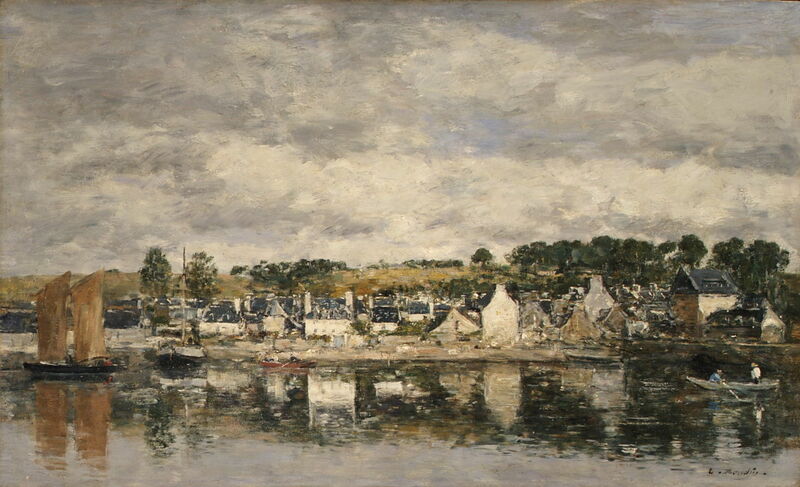 The first two, both known as Camaret, Le Toulinguet (c 1871) and showing almost identical views, include this version in a private collection, and another now in the Philadelphia Museum of Art. 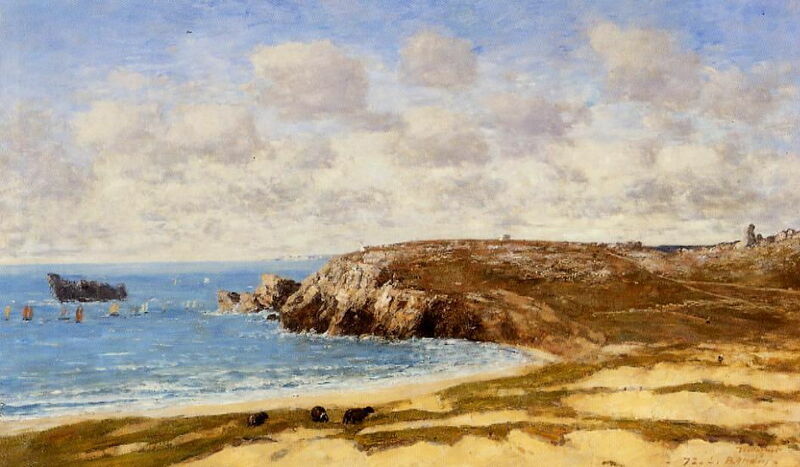 Boudin painted at Camaret, in Brittany, each year between 1870 and 1873. Eugène Boudin (1824–1898), Camaret, Le Toulinguet (1872), oil, dimensions not known, Private Collection. WikiArt. 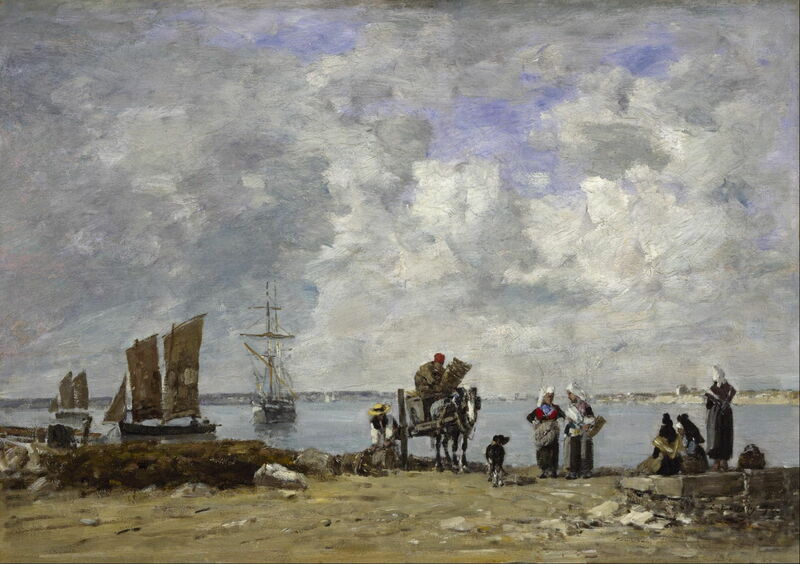 The third possibility is this, Camaret, Le Toulinguet (1872), which is now in a private collection. Eugène Boudin (1824–1898), Fishermen’s Wives at the Seaside (1872), oil on panel, 55.9 x 38.7 cm, Museum of Fine Arts, Houston, TX. Wikimedia Commons. He also painted scenes of local people and their activities along the northern coast, such as this Fishermen’s Wives at the Seaside (1872). Boudin’s career appeared little affected by the First Impressionist Exhibition, and he did not return to show his work at the group’s later exhibitions. Instead, he concentrated on achieving success in the Salon, and the better marketing brought by Durand-Ruel. Eugène Boudin (1824–1898), Ary Scheffer Place, Dordrecht (1884), oil on panel, 27 × 21.4 cm, Dordrechts Museum, Dordrecht, The Netherlands. Wikimedia Commons. In Ary Scheffer Place, Dordrecht (1884) he sketched a more urban scene, although still with water at its heart. 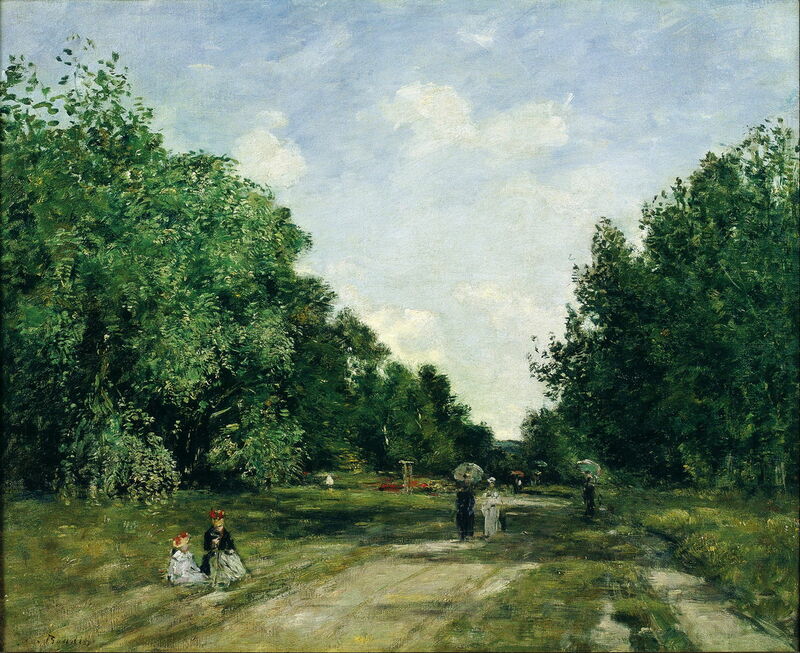 Eugène Boudin (1824-1898), Parc Cordier in Trouville (c 1880-5), oil on canvas, 51 x 62 cm, Museu Nacional d’Art de Catalunya, Barcelona. Wikimedia Commons. In Parc Cordier in Trouville (c 1880-5), under another of his masterly skies, he captures the texture of foliage particularly well. Following his early inspiration by Troyon, he painted many views of cattle and the fields immediately inland of the north French coast too. Eugène Boudin (1824–1898), Washerwomen by the River (c 1880-5), oil on panel, 26.2 × 36.2 cm, Israel Museum, Jerusalem. Wikimedia Commons. 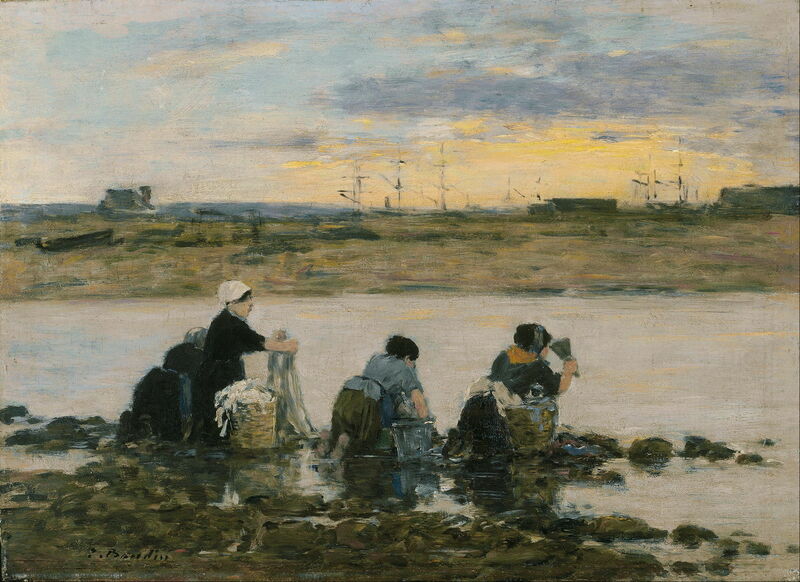 As with many artists at the time, he painted Washerwomen by the River (c 1880-5). Saint-Valery-sur-Somme. 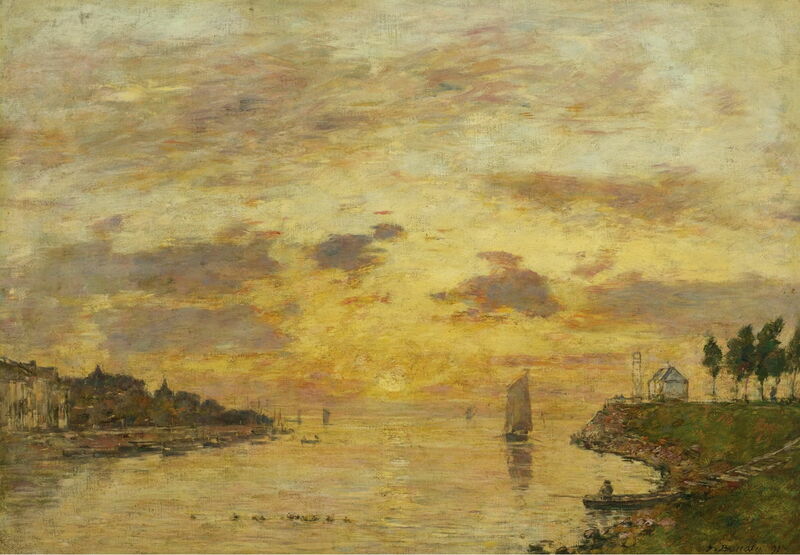 The Mouth of the Somme (1891) is another more colourful view featuring the setting sun, further north-east along the coast from Le Havre. Eugène Boudin (1824–1898), The Bay of Fourmis (1892), oil on canvas, 54.9 × 90.2 cm, Metropolitan Museum of Art, New York, NY. Wikimedia Commons. 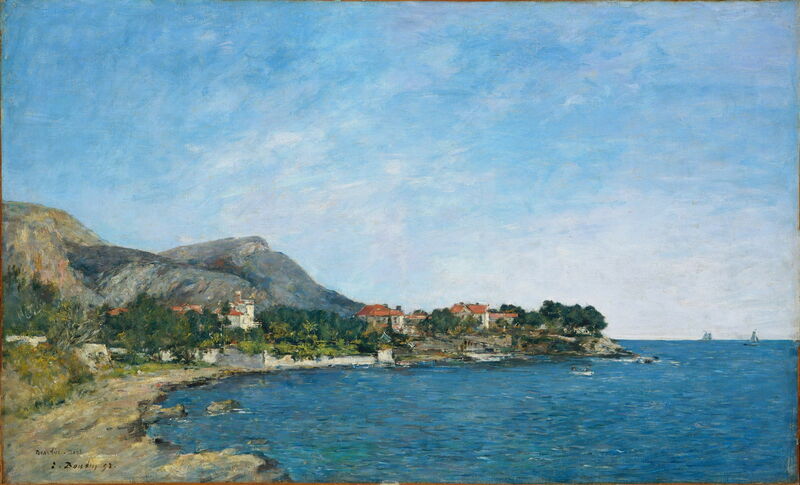 Once he started to visit the French Mediterranean coast, he painted many of its views, including The Bay of Fourmis (1892). Still unpopulated and unspoilt at that time, this is situated between Nice and Monaco, not far from the border with Italy. 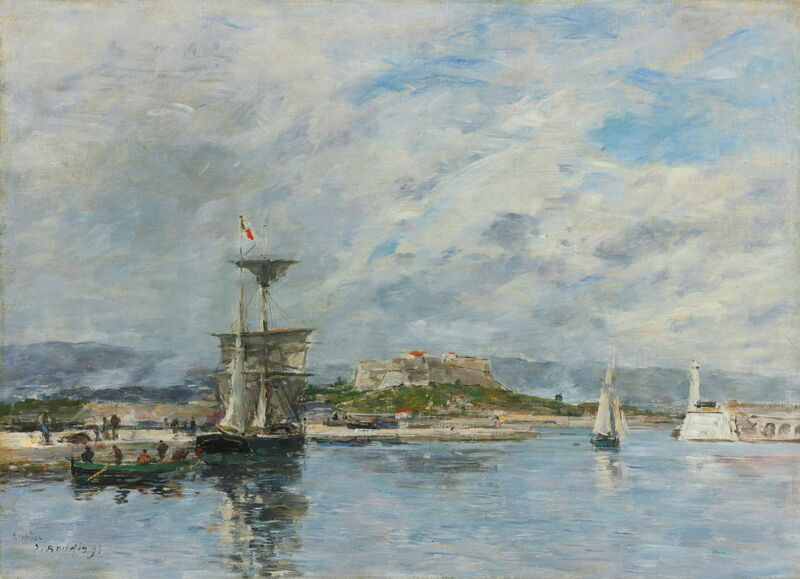 Eugène Boudin (1824–1898), View of Antibes. The Quay, Morning (1893), oil on canvas, 40 × 55.2 cm, Private Collection. Wikimedia Commons. View of Antibes. The Quay, Morning (1893) is on the Côte d’Azur between Cannes and Nice, again not far from the Italian border. High speed direct train services to this area had started back in the 1880s, opening access to artists and tourists alike. Eugene Boudin (1824-98), Piazzetta San Marco in Venice (1895), oil on canvas, 21 x 38 cm, Private collection. WikiArt. Boudin visited Venice several times. 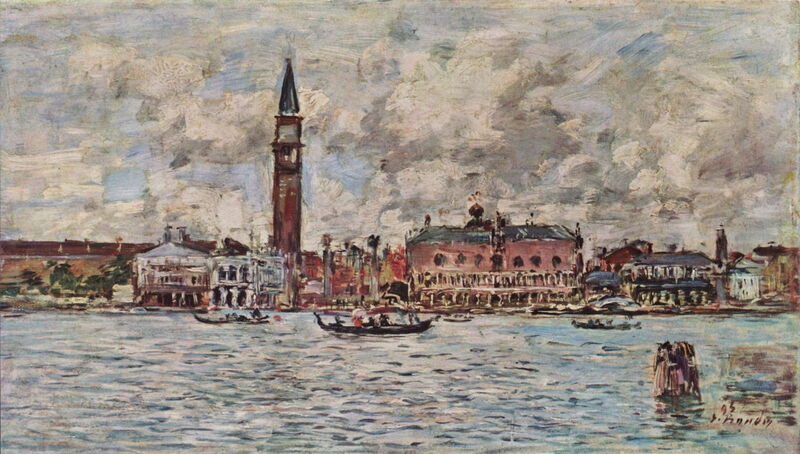 Among his paintings there was Piazzetta San Marco in Venice (1895), which adopts the same view and composition as Renoir’s earlier Doge’s Palace, Venice (1881). This painting is sometimes mis-titled as the Piazza San Marco, which it does not show. The tower is the high Campanile, as detailed here. Eugène Boudin was a major influence not only on Claude Monet, but on Impressionism as a whole, and was acknowledged as such. However his distinctive style changed little in response to the First Impressionist Exhibition, and he continued to paint in his own way, independent of the great changes which took place in the latter half of the nineteenth century. His skies never disappoint, and his honest, fresh, painterly work is undervalued. Thankfully his works remain accessible, as they are in many museums and galleries around the world, for us to enjoy. The sad note is that his pastels, which are in many ways even truer to his vision, are harder to come by. Maybe one day someone will publish a full account of them, with ample illustrations. Bergeret-Gourbin A-M (1996) Eugène Boudin. Peintures et Dessins. Catalogue Raisonné Musée Eugène Boudin Honfleur, Somogy Éditions d’Art. ISBN 978 2 8505 6250 1. His latest catalogue raisonné is by R Schmit, in three main volumes, 1973, with two supplementary volumes, in 1984 and 1993, all published by Galerie Schmit, Paris. Posted in General, Painting and tagged Boudin, Durand-Ruel, exhibition, Impressionism, Jongkind, Millet, Monet, painting, Troyon, unknown, vanished. Bookmark the permalink. Really great piece on Eugene Boudin from eclecticlight.